I love desserts that are made with gula Melaka. Do you? For those who don't know, gula Melaka is a sugar that is commonly used in Southeast Asia for our desserts. According to Wikipedia, it is made by extracting the sap from the budding flowers of a coconut palm. The sap is boiled to thicken, leaving a sticky sugar that is whipped and poured into tube containers to solidify. Maybe I'm too fussy with my baking... Or call me a crazy baking woman! LOL! To me, a real good gula Melaka chiffon cake has to be loaded with a good amount of gula Melaka but by doing so, I won't have enough sugar to beat the egg white mixture properly. Bummer!!! To counter this complication, I have thought of adding pieces of gula Melaka into the cake batter to create pockets of gula Melaka syrups inside the cake. Sounds yummy huh? ... but by doing so, the sugar pieces will sink to the bottom of the cake and the only way to stop the sugar from sinking is to add cream of tartar to stabilise the egg white mixture... Cream of tartar in my chiffon cake? Errr... Due to the reasons that I have mentioned at here, here, here and here, I will prefer not to do that!!! Double bummer!!! To compromise all potential obstacles that I'm facing, I have finally baked this cake!!! I won't say that this cake looks perfectly good but I must say that it tastes perfectly good!!! It is moist, fluffy and fully loaded with gula Melaka!!! 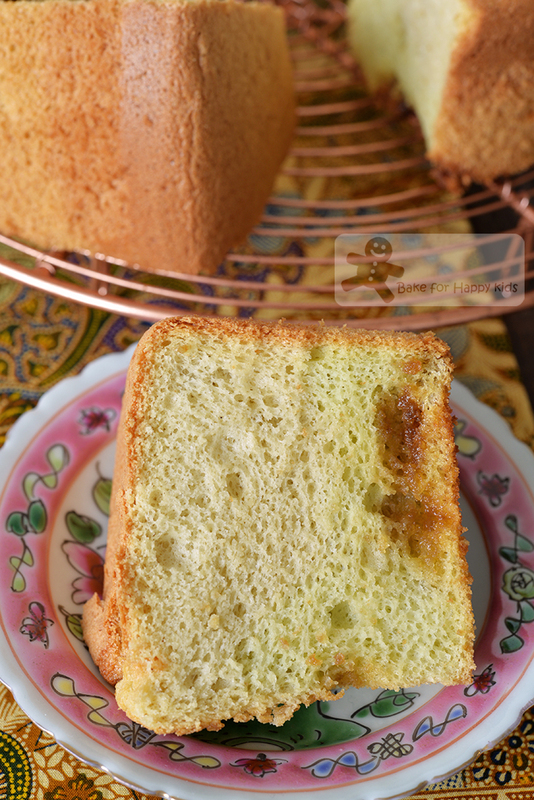 This gula Melaka chiffon cake with NO added cream of tartar is made with two chiffon cake layers; the pandan and the gula Melaka cake layers. Two layers because the pandan cake layer is moister and softer than the gula Melaka cake layer, thus making the cake as a whole being enhanced in its softness and moisture. NO cream of tartar because I believe that although the addition of cream of tartar will make the cake more structurally stable, it will also make it less soft!!! See the correlation! pandan cake layer + gula Melaka cake layer = softer and moister gula Melaka cake! 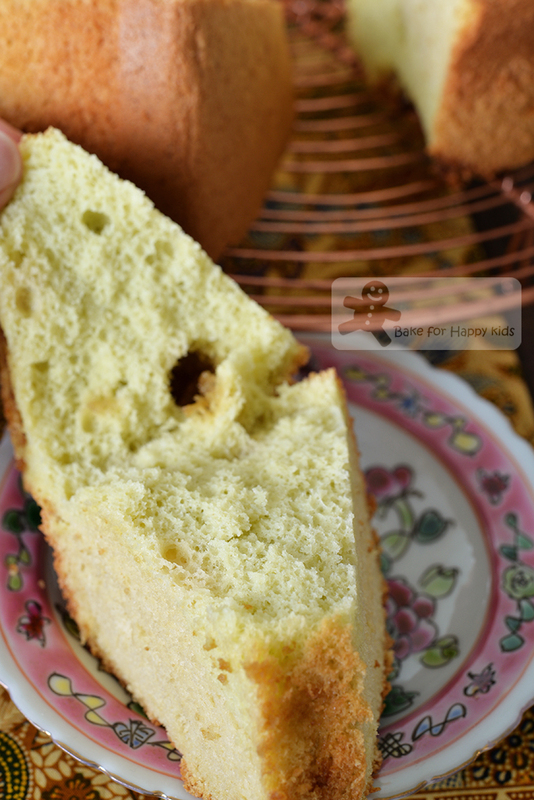 chiffon cake + no cream of tartar = softer but less rigid chiffon cake! chiffon cake + gula Melaka sugar pieces + very minimal baking powder = sugar pieces will sink minimally and the cake is still ultimately soft and delicious with pockets of gula Melaka syrup! 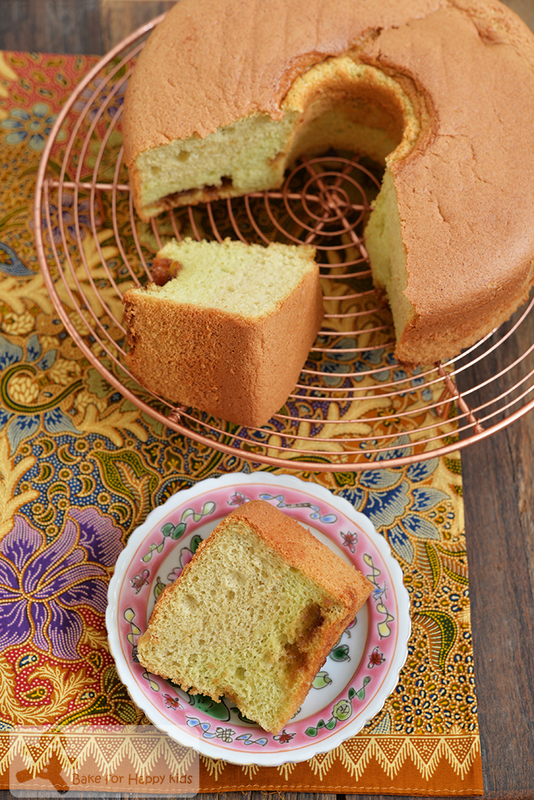 This is the best gula Melaka chiffon cake that I have baked so far... How about yours? Too complicated? Nay! Want to watch my one minute video to see how I baked this cake? Can you see that there is two cake layers in my cake? Extra soft with no added cream of tartar! Here's the recipe that is VERY modified from Tried and Tasted with no addition of cream of tartar. Please make sure that all ingredients are at room temperature. Place all gula Melaka syrup ingredients in a saucepan and cook over low heat until gula melaka is melted. Remove from heat. Discard the pandan leaves and allow the syrup to cool completely at room temperature. Wash and snip pandan leaves into small pieces. Place into a processor and add 2 tbsp water. Process to form a thick paste. Remove and squeeze out all the liquid from the paste through a muslin cloth. The amount of pandan juice yielded should be about 40 ml. Top pandan juice to 40 ml with water if required. Using an electric mixer with a whisk attachment, beat egg whites in low speed until foamy. Increase beating speed to medium (not too high to avoid large bubbles forming). While beating, add sugar gradually and continue to beat until stiff peaks form. Due to this minimal amount of sugar added, the meringue won't be typically smooth and glossy but rather the firm kind. Hence, it is important not to over beat the mixture. While beating the egg white mixture, whisk the gula Melaka and pandan batters. Place egg yolks, gula Melaka syrup, oil and pandan juice in a large mixing bowl and use a hand whisk to combine. Sift flour, baking powder and salt into the gula Melaka mixture and whisk until everything is combined. Place egg yolks, oil, pandan juice, coconut milk and pandan paste or green colouring in a large mixing bowl and use a hand whisk to combine. Sift flour, baking powder and salt into the pandan mixture and whisk until everything is combined. 50g gula Melaka, roughly chopped, about 2 cm chunks, sifted to remove loose small bits of sugar - weight used is after sifted. Divide the meringue into 2 equal portions by weight. Use a hand whisk or a spatula to fold in each portion of meringue by about 2-3 batches into gula Melaka batter and another portion into the pandan batter. It's ok to mix the first batch of egg white mixture kind of vigorously into the egg yolk mixtures but please ensure that the subsequent batches are mixed in very gently until most of the white is not visible after folding. Pour half of the pandan batter very gently into an ungreased chiffon tube pan. Sprinkle half of the gula Melaka chunks over the pandan batter in the pan. Pour the remaining pandan batter into the pan and sprinkle the remaining gula Melaka chunks over the pandan batter again. Pour all of the gula Melaka batter over the pandan batter. Use spoon to level the cake batter in the pan and please DO NOT tap the pan as the gula Melaka chunks will sink further! Bake for 55 mins or until thoroughly cooked. If the top of cake browned too quickly, cover the cake very loosely with a piece of aluminium foil during the last 10-15 mins of baking. Please make sure that that the cake has to be baked for at least a total of 50 mins. After baking, invert the cake immediately and allow it to cool completely before removing it from the pan. To unmould the cake, use a thin rubber knife or spatula to run around the cake. Do not unmould the cake by pressing the cake as there are pockets of syrup inside. May i know if I can use normal pan instead of a tube pan? Tks! You can't because the cake will sink in the middle. Do you use fan forced? Hi Dawn, I prefer not to use fan forced oven function for baking cake. The heating is too strong.